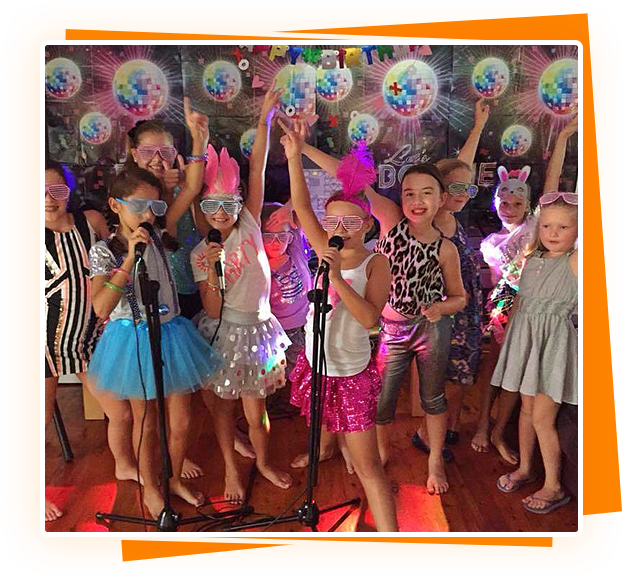 Our Karaoke Star Parties are excellent for kids that love to sing & perform. We play singing competitions and give prizes to the winners, plus if the kids want to create their own ‘boyband’ or ‘girl group’ they can also perform together. An example, a karaoke game is the ‘Karaoke Factor’. You could have all the Kids attend in Fancy Dress as their favourite Pop Star! We have lots of karaoke songs for the children to choose from, our Karaoke DJ Entertainers play the tracks from a vast library held on their laptop which is regularly updated. We have the latest hits, even some of the songs which have not yet been released, but also a large catalogue of other songs. For our Karaoke Star Parties we bring along two microphones so you can sing together and a screen to see the lyrics. The karaoke disco can also include party games, prizes and a disco with lights & lasers, plus all the usual optional extras are still available! Karaoke Star Parties are always great fun and will certainly be a great birthday party. Our Snow Machine produces abundant amounts of very realistic imitation snow over an area of several metres. A smoke machine creates a fantastic atmosphere at any event. These beautiful floating bubbles can fill your dance floor and look outstanding on photos.